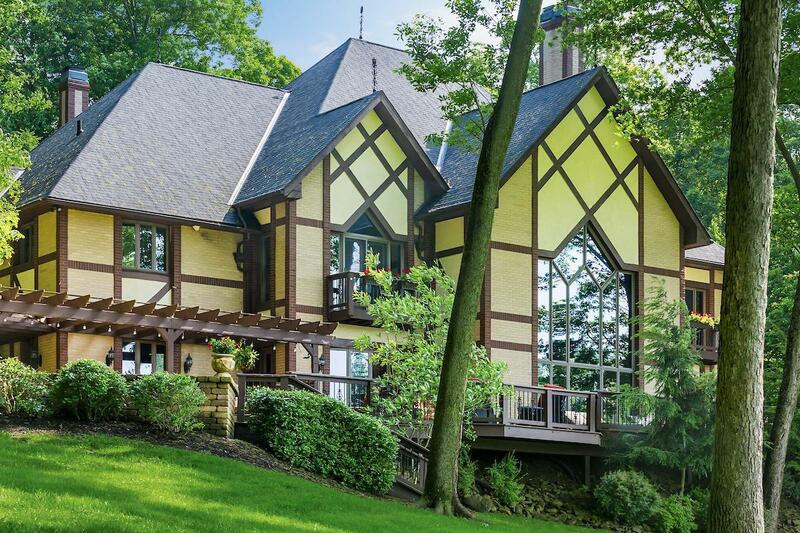 Beautiful Brick & Tudor style home with amazing views! An impressive two-story foyer with a wall of glass. Architectural columns with granite bases lead you to the massive great room. Cathedral ceilings, wood flooring, custom built ins and a massive stone fireplace. The dining area features a crystal chandelier and built in cabinetry with handmade stained glass. The kitchen offers two beautiful islands with granite counter tops from Brazil, coffered ceilings and gorgeous light fixtures. The master suite boosts French doors leading to a balcony, its own wet bar and dream closet. The master bath has a walk-in shower with two shower heads and jacuzzi tub. Entertain outdoors on the large deck or patio with pergola. These are just some of the features of this amazing home. School District: Granville Evsd 4501 Lic Co.